We all have a story to share that can potentially help someone else. Life is messy but it’s also filled with beauty, isn’t it? Each one of us have gone through various trials and if we allow the Lord to lead us through them, then most likely we can come out with a story that when told will glorify our Father in Heaven. My entire story can be condensed to three words: God Is Faithful! I have been through some pretty significant valleys of infertility and losing my brother, but God has proved Himself faithful through every valley as well as through every mountaintop. One of the things that I try to do on a consistent basis is to share my story with someone who may struggling in an area that I’ve gone through. Just the other night my husband and I had dinner with a couple who were undergoing fertility treatments and we were able to share with them our journey, covering the good, the bad, and the ugly. We ended the evening in a powerful time of prayer which bonded us together with this precious couple and it allowed my husband and I to remember God’s faithfulness. 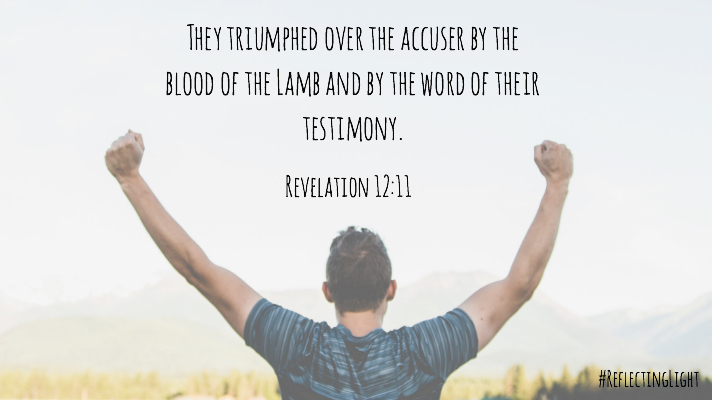 Revelation 12:11 says that the enemy will be defeated by the blood of the Lamb and the word of our testimony. How powerful! Christ did the ultimate work to triumph over the accuser, but you and I also have an important part to play in his defeat. So be brave, my friend, and share your story. Your God will be glorified and you never know who it may help along the way. I keep my story to myself because it involves people other than myself and I fear hurting others, especially my children. I know there is someone who can benefit from my story, but fear keeps me from sharing. How do I handle this? Oh Friend! I totally get it. Ask the Holy Spirit to give you wisdom and discernment on when/with whom to share your story and He will do it. Also, ask a trusted friend if you can run your story by them first for guidance. I do this regularly and it helps. Much love to you today and always! !